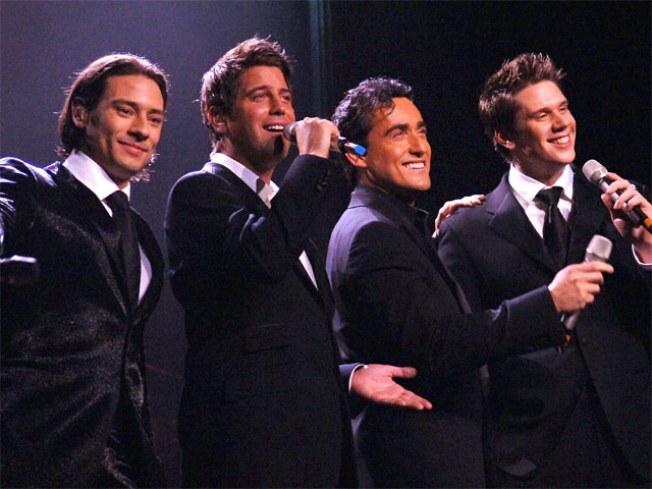 Il Divo sing to your mom at The Beacon. BUON NATALE: Never underestimate the public’s appetite for chisel-jawed Italians with butterscotch tans singing canzone d’amore in perfect harmony. And that’s exactly what you’ll get when soothing supergroup Il Divo take the stage at The Beacon, with special guests Kristin Chenoweth (tiny! Emmy-winning!) and violin virtuosa Vanessa-Mae. 8PM, through Thursday. PITCH BLACK: Alan Arkin’s murky directorial past includes a perennially underrated gem: “Little Murders”, based on Jules Feiffer’s play about a severely dysfunctional family (aren’t they all?) meeting their daughter’s new boyfriend as New York is besieged by random shootings, blackouts and other unsettling happenings. Elliott Gould stars in this dark comedy at its darkest, made in 1971 to boot. Featured as part of the Madcap Manhattan program at Film Forum, 7PM. WHO ARE YOU WEARING? : Come for the plastic surgery, stay for the politically-charged (or just plain filthy) jokes: Tonight’s your last chance to hear Joan Rivers take on the state of the world at the Laurie Beechman Theater at the West Bank Café. How many female comediennes still working in their 70s do you know? Exactly. 8PM.